On the red carpet, celebs have two options when it comes to their hair: They can wear it down and full of hairspray, or it’s pulled up and slicked back. Now, there’s nothing wrong with either style — we love the elegance of a high-and-tight topknot, and full-bodied curls are always in style. But this year on the SAG Awards red carpet, the hair trend du jour was a hybrid: the polished bun with piece-y bangs. 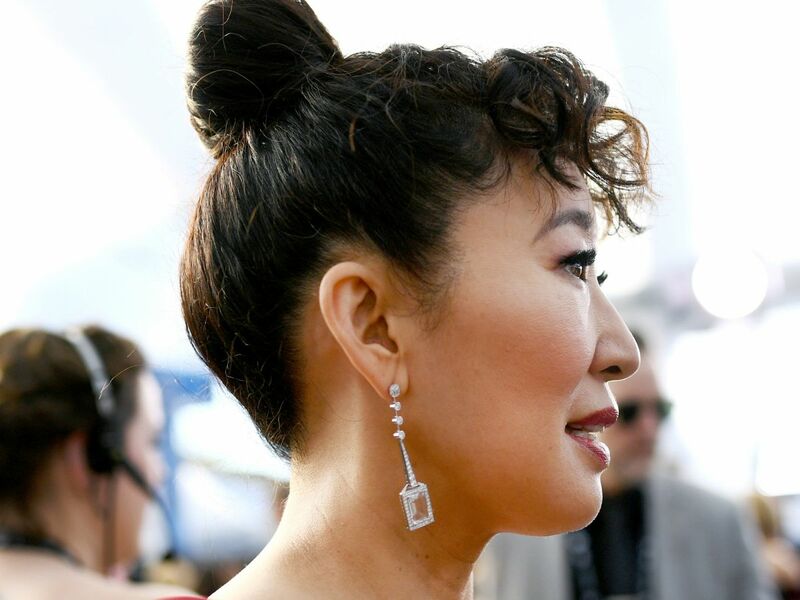 From red-carpet mainstays like Sandra Oh to Hollywood up-and-comers like Fiona Xie, everyone at this year’s SAG Awards showed up in a bun-bang combo. Scroll through to see the best updos from the 2019 SAG Awards — all of which prove that, while Harry Winston diamonds are nice, bangs may just be the perfect accessory to pair with an evening gown. The Crazy Rich Asians actress put her red-carpet glam in the trusted hands of celebrity stylist Castillo. The pro worked the star’s long, black hair into a high bun with side-swept fringe framing the side of her face. There’s something about a blunt bang — cut straight across the forehead — that makes an elegant updo feel cool and relaxed. This ruby-red Jenny Packham gown is gorgeous, but it was Sandra Oh’s hair — a high bun with wispy curls spilling across her forehead — that made the look worthy of the “best dressed” label. 3. Photo: Emma McIntyre/Getty Images. Emma Stone has several signature beauty looks, and we got one of them at this year’s SAG Awards. Celebrity stylist Mara Roszak gave the actress a delicate bun woven with gold ribbon and finished with a glossy side fringe.